DK Duncan to Deliver 5th Annual UTech, Jamaica/ Joan Duncan Memorial Lecture on “Political Leadership: An Enabler or Disabler to Jamaica’s Economic Growth” — UTech, Ja. 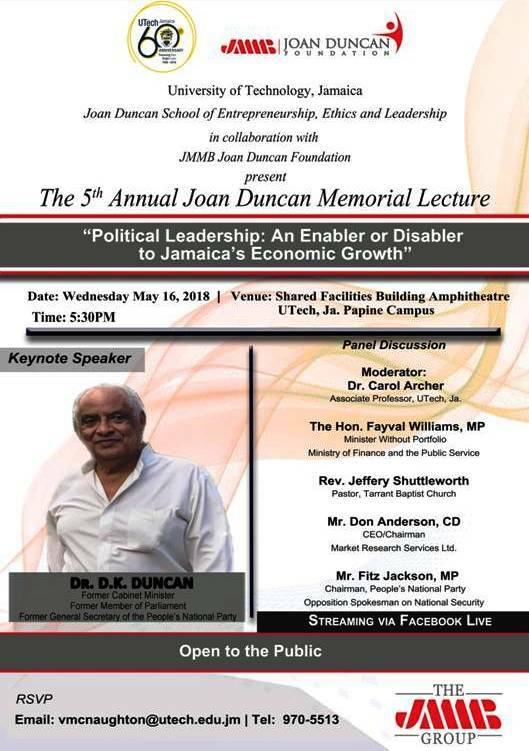 The Joan Duncan School of Entrepreneurship, Ethics and Leadership (JDSEEL), University of Technology, Jamaica (UTech, Jamaica) in collaboration with the JMMB Joan Duncan Foundation, will host the 5th Annual Joan Duncan Memorial Lecture on Wednesday, May 16, 2018 under the theme, “Political Leadership: An Enabler or Disabler to Jamaica’s Economic Growth.” The memorial lecture which honors the vision, mission and passion of the late JMMB co-founder and pioneer of the money market in Jamaica, Joan Duncan will commence at 5:30 pm at the Amphitheatre, Shared Facilities Building, Papine Campus. 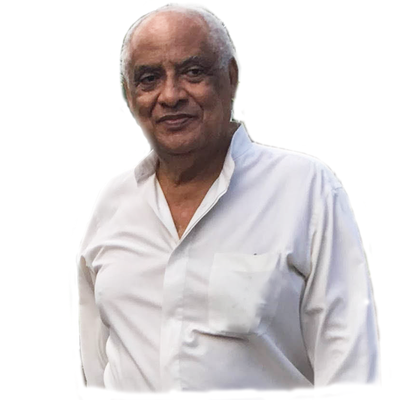 The main address will be delivered by veteran politician Dr. D. K. Duncan, former Cabinet Minister, former Member of Parliament and former General Secretary of the People’s National Party (PNP). Dr. Duncan’s presentation will focus on Jamaica’s past and present political leadership while delivering an analysis on its effect on the growth and development of our nation, and the way forward. Hon. Fayval Williams, MP, Minister without Portfolio, Ministry of Finance and The Public Service. Mr. Don Anderson, CD, Chief Executive Officer and Chairman, Market Research Limited who will share his perspective on whether or not Jamaican politicians listen to the ‘voice of the people’ through polls and whether those polls are authentic. The panel discussion will be moderated by Dr. Carol Archer, Associate Dean, Faculty of The Built Environment, UTech, Jamaica. UTech, Jamaica is this year celebrating its 60th Anniversary in providing quality education in supporting the growth and development of Jamaica, under the theme ‘Pioneering Past; Bright Future.” JMMB Group as it celebrates its 25th anniversary is excited about the theme of this year’s lecture as it explores some core values of the company, namely: integrity, openness and transparency and seeks to address a pertinent issue of leadership at the national level. This tenacity and drive has been a legacy left by Joan Duncan who transitioned at the age of 58, to start a company where any Jamaican could walk in off the street, take a few hundred dollars out of his or her pocket and invest it. Her dream also encompassed the creation of a different kind of work place from the traditional organizations she had encountered in the Jamaican business world. Instead she built a company on the vision of love where employees would work in a fun-loving atmosphere with a commitment to innovation and creativity, integrity and responsibility and each member of the team has the opportunity to learn and grow. The company has become one of the leading financial groups in the Caribbean boasting over 270,000 clients and J$2.58 billion (as at December 2017) in net profit. One of Duncan's most notable achievements was being honoured posthumously in 2011 through the official renaming of the University’s School of Entrepreneurship - The Joan Duncan School of Entrepreneurship, Ethics and Leadership, (JDSEEL). The JDSEEL, UTech, Jamaica is the first School of its kind in the English Speaking Caribbean to offer a specialized B.Sc. Degree in Entrepreneurship. The school officially started in February 2010 and graduated its first cohort in November 2014. It is also the first school of its kind in the English speaking Caribbean to have an active business entrepreneurship incubator centre for start-up businesses. Currently, the Technology Innovation Centre has 51 clients including virtual tenants and converts an occupancy rate of 95%. The JDSEEL was recently nominated by the Jamaica Chamber of Commerce (JCC) at its 136th Annual Awards Ceremony for the prestigious JCC Entrepreneurship Award 2017 and the JCC Yellow Marketing Excellence Award 2017.